Hazard Types: Toxic Hazard, Ballistic Hazard. Containment Protocols: RPC-606 is to be kept within a 150cm x 25cm x 20cm reinforced steel safe, locked with a 4 digit passcode which is to be updated every 3 months. The note designated RPC-606-01 is to be kept on a separate card holder with the side exposing its contents obscured by opaque plastic, contents of RPC-606-01 are not to be exposed to individuals with any knowledge of RPC-606. Asset is to be contained on Site-007 at the Containment Level. Testing with RPC-606 is only permitted to Level 3 Security Clearance and above following Incident 606-VN. Testing with RPC-606 must be done under Biosafety Level 3 containment measures, firing of the object must be done by research personnel preferably with previous training in handling long range weaponry. Failure to follow these guidelines by any of the research personnel involved are grounds for termination. No less than 4 armed ASF personnel trained in close quarter combat must be stationed at a distance of no more than 3 meters from marksmen wielding RPC-606 to prevent any attempt at a Containment Breach. Under no circumstance is RPC-606 to be used for any purpose beyond testing, or wielded by Class-D personnel. Description: RPC-606 is an anti-personnel sniper rifle, identical in appearance to a PGM 338 sniper rifle originally was designed to function as both an anti-personnel and anti-materiel rifle. Its anomalous properties are displayed when aimed and fired at any living human within an effective firing range of 500 meters to 1200 meters. RPC-606 requires no ammunition to be fired, however after striking a target once it will no longer be able to strike the same target. A target struck by RPC-606 will develop a random disease related to the area of impact, with a preference for tumors. Notably the anomalous effects of RPC-606 do not develop on a target protected by standard biohazard safety clothing such as protective head coverings or respiratory masks. When firing RPC-606 it will always leave behind a trace of the shot, nebulous in appearance, revealing the marksman position. Testing reveals this trail to be composed of minute particles of a bright powder of unknown composition, colored a noticeable dark red hue. The object also possess a minor cognitohazard related to a note found with it during recovery (Referred to as RPC-606-A) and as such this note has been archived. A non anomalous imitation has been procured for examination by research personnel since its contents have to date not been deciphered. RPC-606 was found during containment of the anomalous seabed laboratory found near the coasts of ██████, Australia. Reports from local authorities of electromagnetic disturbances and communications interruptions alerted local Authority agents, leading to investigation of the area and discovery of the supposedly abandoned and derelict submarine facility. During the raiding of the lab by MST-Echo-9 “Seasiders”, three anomalous objects were recovered from the laboratory. Asset was found in a crate on the upper levels of the laboratory. Along with the object some notes were found in the crate. The prototype for the weapon that leaves no trace behind has been done. I dub it the "Veuve Noire", in homage to its French design. I have to admit, such a feat was not easy… technology from my other invention, the Geneticist's Arm was highly useful. Development is going smoothly. I have managed to code in the weapon memory over 500 different ailments. It has not been an easy task given the variety of diseases and organs in the human body. Sadly, I have not found a way to select one specific ailment. I can aim at whichever organ I want… but I haven't found a way to decide which ailment I want to inflict. Trying to program the disease selection I screwed up… now the device seems to preferentially cause tumours. Oops. Guess this will make the origin of the disease even harder to trace. I have given up on further modifying this… now I managed to eliminate the need for ammunition. The Parasitic Gene ████ has some wonderful properties. But now the weapon will betray the position of the marksman when fired… nobody will want such a weapon now. Into the trash it goes. Objective: Anomalous effects from RPC-606. Subject: D-606-1 (Caucasian, male, 25 years old) subject was taken to testing range and placed 200m from marksman. Marksman instructed to aim at D-606-1's head. Results: Screening after experiment revealed no anomalous effects on subject. Subject reports no direct effects to exposure. D-606-01 was put under observation, undergoing screenings for a month until discharged without any new medical issues. Researcher Note: Shots at this distance don't have any effect. I propose further testing with the same conditions except for distance, after we're done observing D-606-01. -Dr. Bells. Subject: D-606-1 (Caucasian, male, 25 years old) subject was placed 500m from marksman. Marksman instructed to aim at D-606-1's head. Results: Screening after experiment revealed the development of a primary osteosarcoma on the frontal bone, measuring 7.62×51mm. No metastases were found. Researcher Note: Impressive, this thing actually caused a rare bone tumor right at the point of impact instantly. Subject reports strong burning sensation on impact site, notably after firing, a trail of nebulous particles reveals the shot trajectory even though no visible projectile is shot. Neither is there any projectile embedded on targets after exposure. -Dr. Bells. Objective: Range effects on targets. Subject: D-606-3 (Caucasian, female, 30 years old) subject was taken to testing range and placed 1200m from marksman. 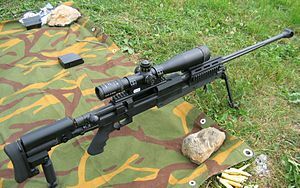 Non anomalous rifles of this model have an effective firing range of 1400 meters. Marksman is told to aim at D-606-2's heart. Results: Screening after experiment revealed the development of stable atherosclerosis on the left circumflex artery. Subject reports mild burning sensation on impact site. Researcher Note: The longer the distance of the shot the lesser the gravity of the ailments inflicted by this weapon are. -Dr. Bells. Addendum 4: Incident 606-VN report." On 11/22/20██, during testing with RPC-606, ASF personnel received reports of a Security Breach at Testing Range involving a Class-D wielding asset and indiscriminately firing at research team. Upon receiving reports of asset being a long ranged weapon, a team of snipers was dispatched to the testing range, as soon as they arrived, three of them were shot by D-606-06, who was then incapacitated by a shot to the right shoulder from one of the remaining forces and later sedated. The research team when questioned replied that the D-Class had suddenly started acting violently and with contempt from requests to put down the weapon, all of this happened after reading the enclosed note that came with RPC-606 which was contained alongside object on storage crate.